Once a child begins to understand spoken language the scope for learning about the world expands enormously. We can talk to the child about everything we do, we can talk about what we are going to do and what we did yesterday or last week. We can talk about many things that are outside the child's range of actual experience, such as what the postman does at the sorting office or the doctor at the hospital, what astronauts do or why the wind blows. Many psychologists have emphasised the importance of language for teaching concepts and ideas, the tools for thinking, to children (Vygotsky 1986, Bruner 1983). Any child with a delay in learning to communicate in a language is going to be seriously disadvantaged in being able to gain knowledge about the world. Babies have experience of communicating in the first months of life and they soon learn that they can control their parent's behaviour, for example, by smiling and crying. They begin to understand people, their behaviour and moods and to know when someone is happy, sad or angry from the clues provided by tone of voice, facial expression and behaviour. This is the first step on the pathway of social and emotional development. A number of studies have drawn attention to the delay in beginning to talk in children with Down syndrome relative to their level of language comprehension. 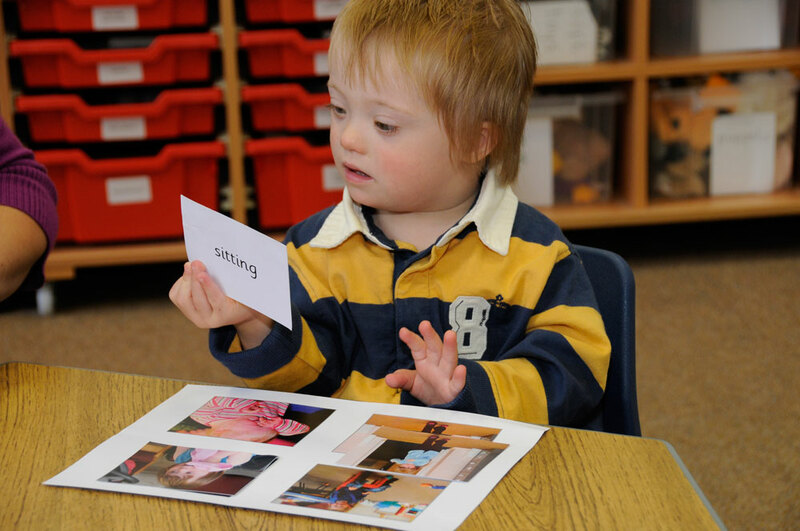 The most recent research available on the development of expressive speech in children with Down syndrome is that of Jon Miller and his colleagues at the Waisman Centre, University of Wisconsin USA. The researchers pooled the data for all the children and were able to identify three groups, which they describe as slow, average and fast in their rate of vocabulary acquisition. In the average group there were 9 children with Down syndrome and 11 ordinary children, in the slow group 11 with Down syndrome and 4 ordinary and in the fast group 8 ordinary children only. These results emphasise the wide variation in language development seen in all children. By the end of the study, 4 children thought to be showing ordinary development twelve months earlier were now classified as language delayed and in need of remedial help. 9 children with Down syndrome were in the average group and were learning words at about the same rate as almost half the ordinary children. She suggests that dichotic listening studies indicate impairment in the usual left-hemisphere speech areas of the brain. However this may be the result of language delay rather than a cause according to evidence from the study of the hearing impaired (Sacks 1988) and from more recent evidence from more linguistically able people with Down syndrome (Piccirilli et al. 1991).Oliver Sacks suggests that it is only when rule-governed language is established that the left hemisphere centres come into play, reminding us of the dynamic nature of all functional brain development. The children generally seem keen to communicate and to interact, perhaps showing continuation of their interest in people in the first year of life. The social skills and behaviour of the majority of children with Down syndrome are good for their developmental age, as is their understanding of other people and what they are thinking and feeling (Baren-Cohen et al. 1992). Parents often comment on the empathy and social sensitivity of teenagers with Down syndrome (Buckley & Sacks 1987). Using written language systems can have a variety of benefits. Symbols and words can prompt production and be used to greatly increase productive practice. They may help to overcome the auditory memory problems even at the stage of first word learning. Later they can be used to prompt and help the child to practise longer utterances. This may help improve the ability to spontaneously produce intelligible sentences. Print is a very powerful tool for language teaching as the child can be taught to read, understand and practice grammatically and syntactically correct utterances (Buckley & Bird 1993).